Housing is easily one of the single biggest topics for Haisla members that we’re seeing as we go through the Comprehensive Community Plan, so we wanted to let members know what has been happening for housing lately. A render of the Kitamaat Village apartment building. One of the largest projects for Kitamaat Village is an affordable apartment complex, which will see 23 units built. Yellowridge recently won the contract to construct the facility, and the BC Government through BC Housing just this past week committed a substantial amount of funding towards this project. The apartment unit will, once completed, be managed by the M’akola Housing Society. The apartments will be a mix of 1, 2, and 3 bedroom units. Given the construction timeline, the apartments will be available sometime in 2020. Duplexes in Kitamaat Village under construction. Another major project is the construction of duplexes. The Canadian Mortgage and Housing Corporation (CMHC) has funded this project, which was awarded to Technicon, for three duplexes, a mix of 2, 3 and 4 bedroom homes. 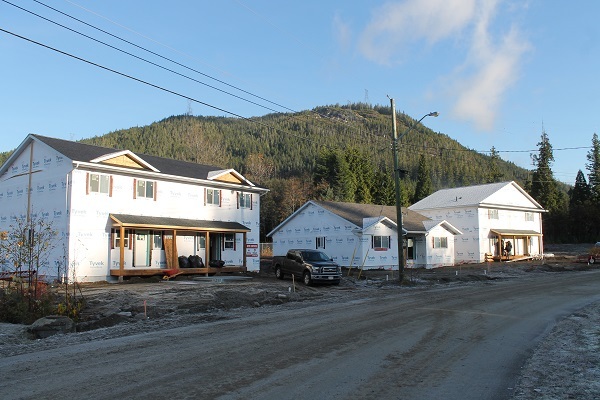 Haisla Nation Council’s Community Development department will manage these homes, and once completed, either late spring or early summer 2019, they will begin accepting applications for tenants. In total this means 29 new living spaces in progress in Kitamaat Village which will be open over the course of the next 2 years. Youth Summit coming to Kitimat!